I hope your journey to our secret castle lair nestled deep in the mountains was not too eventful. Please take a seat at the lab bench and I will tell you about our experimental program. Don’t mind the mutated monsters peeping from behind the glowing test tubes. They won’t harm you. On second thought maybe they will, so keep a careful eye on them. Our trusty assistant Igor (or Eye-gore depending on whether you prefer comedy to horror) will bring you a drink in a beaker filled with a bubbling liquid. Don’t mind if you spill the drink on your clothes; that is what white lab coats are for! 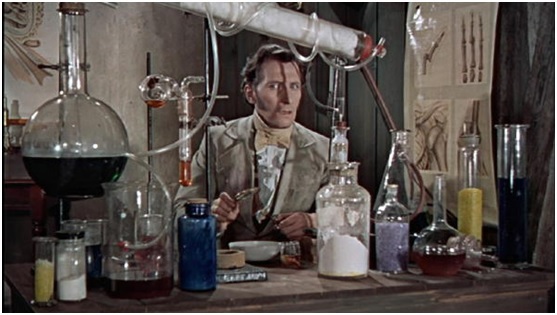 A typical mad scientist’s lab from 1956’s Curse of Frankenstein (Hammer Films). My description of our metaphorical “lab” corresponds to the image that most people conjure up when they hear the word “laboratory.” This is especially true for children who often include bubbling beakers and test tubes when they take part in a “draw-a-scientist” test. Most people have never visited a real-life laboratory, so their conceptions of what a lab space looks like comes predominantly from depictions in movies, television shows, comic books and video games. This demonstrates the power that entertainment media can have in shaping our perceptions about science and scientists. The relationship between entertainment depictions and public perceptions of research laboratories is one reason we chose to include “lab” as part of our blog’s name. The metaphor of the mad science lab should provide anyone stumbling upon this site with an instant explanation for a connection between the realms of science and entertainment. But the metaphor of the “lab” serves other purposes in explaining our blog’s mission. For one thing, even though we are a humanities based research group, we are literally a “lab” housed within an academic institution. 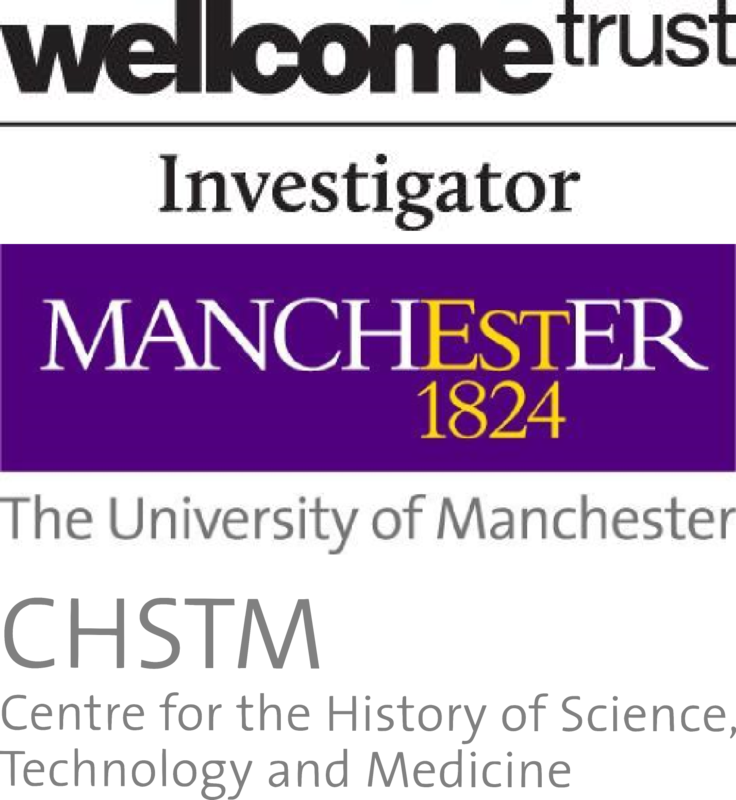 That is, we are a group of scholars sharing the same space who are dedicated to studying independent projects in the hope of understanding a larger issue. In this case, the issue we are pursuing also speaks to “lab” as an apt metaphor for our blog. Like chemists, the goal of our research is to understand what new compound is produced when two radically different elements –science and entertainment– are experimentally fused together. Science is considered the ultimate objective endeavour, while the word entertainment is synonymous with frivolous. What we hope to show in our research and on this blog is that the fusion of these two cultural activities can have significant consequences for both science and entertainment. 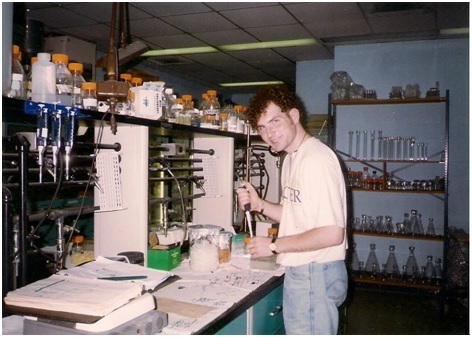 Back in the day doing real-world experiments in Professor Wolfgang Stephan’s lab at the University of Maryland-College Park. One of the reasons that I left my successful career as a bench scientist was a realization that scientific depictions in entertainment media were not uniformly negative or simplistic and that most academic scholars were not discussing this. The overwhelming focus of discussions about science in entertainment tended at the time to be about how inaccurate the science was in these texts. The film that sparked my transition from a practicing scientist to a scholar studying media science was 1997’s GATTACA. When I first saw the trailer for the film I thought to myself “Well that looks like another science-bashing movie from Hollywood.” But then I watched the film. What I saw was not a film mindlessly railing against scientific progress. Instead the film presents a sophisticated approach to the topic of genomic enhancement that rises to the level of a bioethical text by not faulting the technology but the adoption of an ideology of genetic determinism for dystopic future. Over the last five years several scientific groups have also decided that entertainment media can be an appropriate avenue for science communication including the U.S. National Academy of Sciences’ Science and Entertainment Exchange, the American Film Institute’s Sloan Science Advisor program, USC’s Hollywood Health and Society program, and the multi-sponsored Entertainment Industries Council. This fusion of science and entertainment has meant that labs in recent movies are more likely to look like the real-life research labs that I worked in than they are to resemble the mad science labs of yesteryear. The lab depicted in 2009’ Splice (Gaumont) is far removed from a traditional underground mad science lair. The initiatives emerging from scientific organizations indicate that the science and entertainment landscape is getting richer. 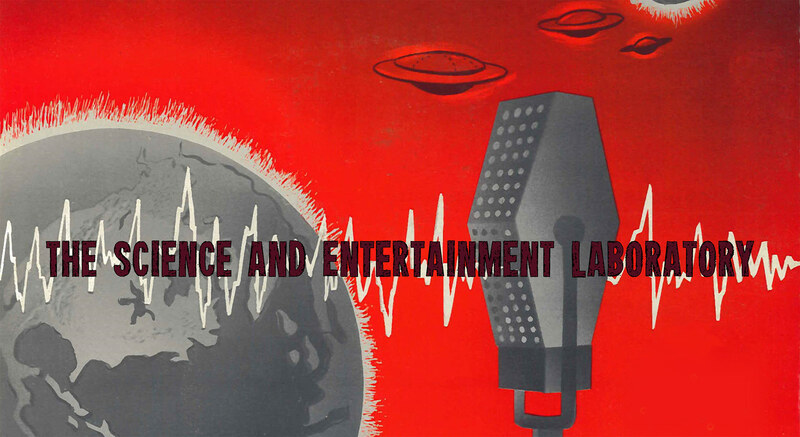 Here at the Science and Entertainment Lab we will discuss these future developments and any other issues related to the intersections of science and entertainment across media and also historically. So, welcome to the lab! I hope you come back to visit often as we plan on releasing new posts on a weekly basis. We are always happy to add more victims to our experiments!